Team India’s South Africa Tour Will Starts Today With The First ODI match. There are Total 3 ODI Cricket matches and 2 Test Matches. The First match Will today on Johannesburg (The Wanderers Stadium ). Mahendra Singh Dhoni is The Captain and wicket keeper of India. Second match is at Durban on 8th December and last match at Centurion on 11th Of This Month. AB De Villiers Is The Captain of Team South Africa. 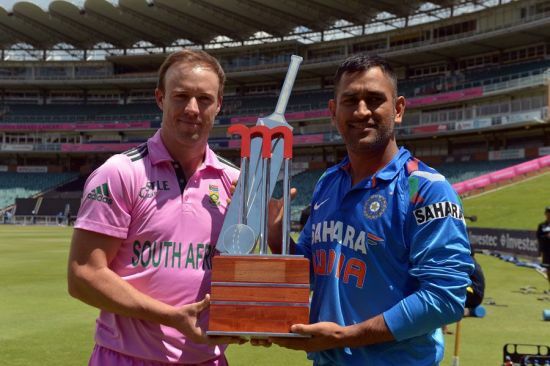 This is The First Match Of South African Cricket Team In Pink Jersey. India Cricket Team Squad For The South Africa One Day Cricket Match – MS Dhoni, Ravichandran Ashwin, Shikhar Dhawan , Ravindra Jadeja, Virat Kohli , Bhuvneshwar Kumar, Amit Mishra, Mohammed Shami, Ajinkya Rahane, Suresh Raina, Ambati Rayudu, Ishant Sharma, Mohit Sharma, Rohit Sharma, Umesh Yadav, Yuvraj Singh etc. The Official Broadcaster of This Cricket Series is Ten Sports. You can Watch all the One Day and Test Cricket matches On Ten Sports Channels (Ten HD, Ten Cricket, Ten Cricket International) . You can watch India Vs South Africa Live also on DD1. DD National Channel Is Telecasting India Tour Of South Africa 2013. Doordharshan will Only Telecast The One day Cricket matches.